The Melbourne Cup is by far the biggest sporting event in Australia. This thoroughbred horse race consisting of 3 year old and older is known as the richest two mile handicap on the globe. The race takes place on the first Tuesday in November, which in 2014 will fall on November 4th. Also referred to as the Race that stops the Nation this event is a celebrated holiday in Victoria. It is believed that over 650 million viewers watch the Melbourne Cup on their televisions while over a 100,000 fill the stands at Flemington Racecourse in Melbourne to enjoy the event in person. The total purse for this race is over 6 million dollars and the winner takes home 3.6 million. That alone makes this 3,200 metre sprint something special. The first running of the Melbourne Cup took place in 1861. Frederich Standish is remembered as the events founder. Archer, a 16.3 hand bay, captured the win and would win again the following year. The event has grown significantly over the years making it the grand celebration for Aussie’s everywhere. Horse with the most wins: (3) by Makybe Diva who won in 2003, 2004, and 2005. Jockey with the most wins: (4) by Bobby Lewis in 1902, 1915, 1919, and 1927 and (4) by Harry White in 1974, 1975, 1978, and 1979. Trainer with the most wins: (12) by Bart Cummings spanning the period from 1965-2008. Owner with the most wins: (4) by John Tait, Etienne de Mistre, Dato Tan Chin Nam, and Lloyd Williams. Here are the winning horses of The Melbourne Cup over the past 5 years. Also listed is their course time. The course record was set by Kingston Rule in 1990 and is 3.16.30. Aussie punters will enjoy these links to competitive bookies online so they can be ready to bet on the 2014 Melbourne Cup from their desktop, laptop or favourite mobile device. There is something completely memorable about an sporting event so grand, so huge in stature that it lifts the spirits of a nation. This is the case with The Melbourne Cup in Melbourne, Victoria, Australia. This event brings together the best of the best that thoroughbred racing has to offer. It should be noted that even though Victoria celebrates this event as a annual holiday millions of other Australians celebrate this day as well. 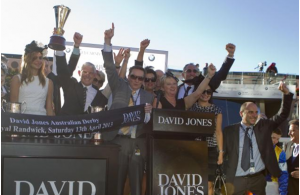 On November 4, 2014 more Melbourne Cup memories are waiting to be made enriching a legacy that prevails above all in the minds of Aussie’s and horse racing fans and punters around the world. Turn to ihorsebetting.com for the latest information on the 2014 Melbourne Cup and other great horse racing events throughout the year.